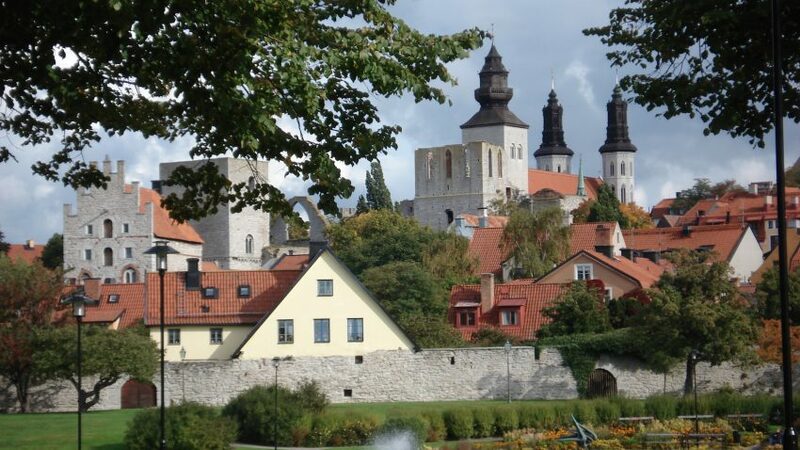 Researchers from ACES participated in this year’s Almedalen week (Almedalsveckan, a well-attended annual event taking place in and around Almedalen, a park in the city of Visby on the island Gotland) along with experts from the Baltic Sea Centre, Stockholm University, Trossa, Swedish Chemicals Inspectorate and MistraPharma. The Swedish initiative Sustainable Seas (Hållbara Hav) organised a series of seminars aboard the brig Tre Kronor af Stockholm and housed an exhibition about life below the surface of the Baltic Sea called “Environmental challenges of the Baltic Sea.” An additional exhibition called “Studio with kitchen” with focus on sustainable marine environment was put up on the quay next to the. The purpose of the event was to raise awareness about the problems the Baltic Sea faces. The event kicked off with a panel discussion on antibiotic resistance with Nina Cromnier, Director General of the National Chemicals Inspectorate and Anna Linusson, CEO of Swedish Water. I was the moderator during the discussion. The next day, one of Sweden’s most prominent journalist/producer Folke Rydén showed his upcoming film about micro-plastics in the Baltic Sea called “The Baltic Sea Expedition.” The film served as the starting point for a panel discussion about the “role of the policy in the individual consumer. Besides Folke Rydén, Anna Kärrman who’s an associate professor at Örebro University along with Åsa Westlund, MP for the Social Democrats were present. I moderated this session too. An important issue discussed concerned the question of who is really responsible for ensuring sustainable development in the Baltic Sea region? Is it the politicians or the consumers? Discussions on micro-plastics took place during the entire. At lunch, a seminar entitled “Plastic in the Baltic Sea – what does that have to do with you?” was followed by a panel discussion with Mikael Karlsson, the European Environmental Bureau, Yvonne Ryding Yvonne Ryding Scandinavia AB, Anna Kärrman and Anders Finnson, Swedish Water and myself. The discussion revolved around how to tackle the problem of micro-plastics in various consumer products, the options available and the need for new legislation to ban their use in these products. In the afternoon, we presented the research we conduct at ACES and Örebro University presented theirs. Representatives from ACES were PhD students Sofia Bejgarn and Berit Gewert. Marie Löf, former PhD student at ACES and and now communicator at the Baltic Centre Sea Centre also participated. Day 3 began with the seminar “Does the dismantling of journalism lead to the worsening of the marine environment?” The seminar focused on the responsibilities journalism has in conveying an accurate picture of the risks to the Baltic Sea. A panel discussion followed, which was moderated by Henrik Hamrén, science journalist at the Baltic Sea Centre, and participants included, Johan Rockström, Professor and Director of the Stockholm Resilience Centre as well as Tina Elfwing, Director of the Baltic Sea Centre. After a break, a second panel discussion took with the theme “The chemicals nearest the body: what’s in our textiles?” which, among other things, was about chemicals used in our clothes and harmful they are. Participants were Ingela Andersson, Acting Head of Department for Development of legislation and other policy instruments at the Swedish Chemicals Agency, Mikael Karlsson and Ylva Weissenbach who chemical specialist, H & M representatives and myself. Göran Lindstedt, CEO of Sustainable Seas Initiative, acted as moderator. All in all, I am very pleased with the activities of that week. All our seminars have been very well attended and in several cases we have had to turn people away! For those people we installed speaker on the quay so that they can hear the conversation as if they were inside the venue. It was also interesting to talk with colleagues and experts outside of Stockholm University after panel discussions. This was important since I believe that to achieve effective and appropriate measures to deal with the problems of the Baltic Sea academia, industry, NGOs and government agencies need to work closely together. Almedalen offers a great opportunity to bring those stakeholders together in one place. Although we obviously cannot solve the problems on the spot, my experience has shown that the discussions initiated during Almedalsveckan often continue afterwards.